This is the first cloud-centric Linux distro I’ve tried, so it’s hard to make any comparisons, so I’m just going to approach this from a purely objective point of view. What I dislike, what I like, and what my overall feelings are about this project now that I’ve had a chance to use it a bit. Those of you who bother to read anything here on any kind of regular basis know that I’m a picky guy when it comes to my Linux and my applications. So with that firmly in mind, you have to understand that my criticisms here are largely subjective — what I don’t like about some of the applications Kendall and the Peppermint team decided to include might be fine for you, and the ones I prefer to have on-hand on my machines might be abhorrent to you. But that’s what a review is all about, right? Opinions! With that little disclaimer out of the way, let’s get crackin’! By far my biggest beef with default applications has to be with the version of PCManFM that is installed by default with this version of LXDE. 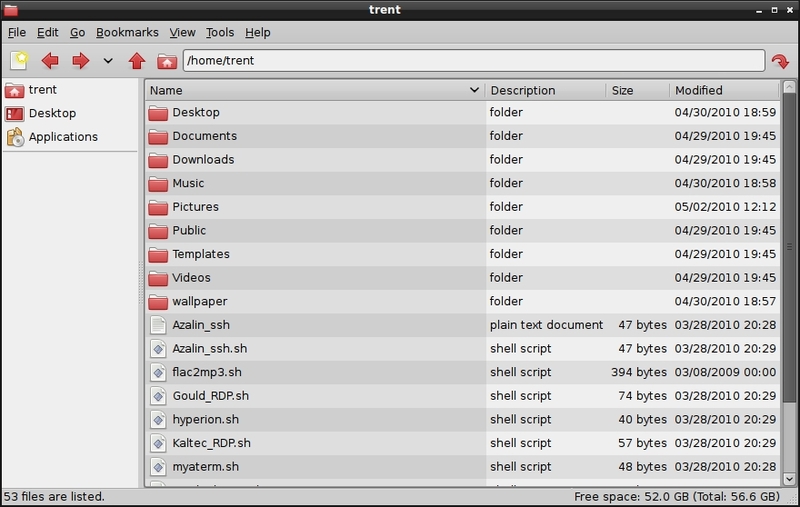 Peppermint uses PCManFM 0.9.5 as its file manager, and, compared to previous versions (notably PCManFM 0.5.2), the one that ships with this distro is hobbled and broken in a number of ways. I’m not certain if this is missing some part of it, or if there’s a bug in this version, but PCManFM 0.9.5 that ships with Peppermint OS seems to be lacking the tree view in the side pane entirely, and there doesn’t seem to be a way to turn it on. You can see that there’s the “places” listed in the side pane on the left, but I prefer utilizing the “tree view” for quick navigation — when you limit the side pane to just “places”, it’s largely just wasted space, I’m afraid. By contrast, here’s what the view menu looks like in Peppermint, COMPLETELY LACKING this functionality! Not only that, but this newer version of PCManFM has eliminated the option to “Always show the tab bar” from the interface preferences (which I find annoying to be lacking)… as a matter of fact, this newer version of PCManFM has eliminated the entire “interface” tab from the preferences altogether! I know Kendall implemented Peppermint with the latest-and-greatest version of LXDE with the latest-and-greatest version of PCManFM for some of its other features, but these things drive me nuts… to the point where I don’t even use PCManFM as a file manager on Peppermint. I discovered that by downgrading PCManFM to an earlier version that actually HAS all these interface features I severely broke the entire desktop, so instead I’m reduced to installing my less-favored Thunar file manager, which at least supports directory tree navigation (even though it isn’t tabbed). What is with new versions of otherwise great applications having FEWER features these days? Do developers sit around and think “okay, for the new version, what useful functions should we remove from this?”. Because with PCManFM, that certainly seems to be the case, at least, that seems to be the case with the implementation of it here in Peppermint. To be fair, I haven’t tried this version of PCManFM anywhere else. Anyway, that’s my rant on the default file manager. There isn’t any way to downgrade it to a more flexible, more functional version without breaking the default desktop as a whole (as I sadly discovered), so I solved this problem by installing an alternative — but still less than perfect — file manager. I mentioned above that Peppermint had, rather strangely, included the discontinued-for-Linux music player Songbird. While it seems odd that the Peppermint team would bundle an application that’s effectively on its deathbed in the Linux world, it’s even more out of place among the otherwise slick selection of light, fast, basic applications and webapps that otherwise make up the app selection in this distro. Songbird, on this old laptop, is a DOG. Slow and sluggish to start up, it eats up lots of CPU cycles, tons of memory, and is painful to use because of how unresponsive it is to interaction. While I’m not particularly a huge fan of any of them, Rhythmbox, Banshee, and especially the fast and basic Decibel Audio Player would all have been better choices than Songbird, if nothing else because they are all a bit easier on resources than Songbird has been on limited hardware in my experience, and unlike Songbird, all three of them have a future in the Linux world. When I review a distro, I like to (as I am right now) write my review with that distro, utilizing the tools available on it to do what I need to do. True to form, I’m writing this review on Peppermint OS, and it’s working fine, but for one thing: I was unable to manage my screenshots for the review effectively with the default options available. The only image editing app in Peppermint is Aviary “Phoenix” image editor, and try as I may, I simply cannot get it to work. I took all the screenshots with the default screenshotting tool included, but when I tried opening them in Aviary so that I could resize them and make some thumbnails, et cetera, it simply sat there forever in the “upload” dialog. No matter what I tried, I couldn’t get it to do anything other than that. Not having any more time to waste on this, I gave up and installed GIMP and did what I needed to do. What “dislike” section of one of my reviews would be complete without my usual rant about the lack of touchpad disabling functionality? While under the “Preferences” submenu there is a “Keyboard and Mouse” applet to handle a couple of extremely basic settings for input devices, as per the norm, there is no means of disabling a touchpad on the mouse section of that applet. Indeed, if it were not for the shell script I keep handy for this purpose, I would not be writing this much stuff on this laptop, because without being able to disable the touchpad, any extended writing is impossible because I’m always bumping it as I type, which causes the cursor to jump around. One checkbox. That’s all I need. One checkbox that says “disable touchpad” in the Keyboard and Mouse applet that I can check, and keep it that way. Seems simple enough, and I know that the Peppermint team didn’t write this applet, but damn it, somebody needs to implement this! Rants over! Now onto the good stuff. Before I even bother going into that, take a look at this. This is a screenshot of an LXTerminal window running htop (which I installed myself). At the time this screenshot was taken, nothing else was running, it was just Peppermint’s default desktop right after a login, and the LXTerminal window you see. That’s it. That’s right. I couldn’t believe it either. Peppermint by default is only utilizing 82 Mb of system memory. And it said 79 Mb just before I launched the screenshot app. Sheesh, no WONDER this distro is so fast. I’m not sure what these guys did here to accomplish this — aside from being stingy with daemons and processes that run on startup — but with this kind of minimal overhead, this is easily a viable netbook OS, and for a regular laptop that’s a few years old, it’s faster than anything else I’ve tested on it. So the first thing I like? Let me be absolutely clear about one thing: Peppermint Linux OS is fast. Really fast. On this tired old laptop, Peppermint boots up from a cold, powered down state in just under 25 seconds from me hitting the power button to being able to log in graphically. From the point I log in to the point where I have a usable desktop is less than 5 seconds. When I tell it to “shut down” it does so in approximately 4 seconds. When I say Peppermint is fast, that’s what I mean. Startup, login, shutdown, there’s no waiting around for this one, even on old hardware like mine. While it’s up and running, with the aforementioned lack of overhead, that leaves lots of CPU cycles and RAM available to handle the tasks at hand. The default LXDE menu and interface is responsive and downright snappy, and applications start up and do their thing without any waiting around at all. I can’t even imagine what this OS would be like on newer hardware. It’d be unbelievable. I was involved in the private beta test of Peppermint OS, and I used the beta for about a week and a half or so. Since then, I’ve installed the final release, and I’ve been using that for a few days now. I have yet to crash Peppermint (except for when I tried to downgrade PCManFM to an earlier version that I liked better, and that was my own damned fault). I like to perform a basic, unscientific stability test when I am playing around with a new distro on this laptop. I leave Firefox open to 8 or 10 tabs with the sites I commonly surf loaded. I leave my mail client open (in this case Google Mail loaded via Prism), my Twitter app open (in this case Seesmic, again loaded through Prism), and I set Xscreensaver to one of the more obnoxious, processor intensive options (like Flurry, for example, or Bouncing Cows). Then I close the lid, walk away from it, and let it sit. For hours. Sometimes overnight. If there’s any kind of instability inherent in the distro, it rears its ugly head in this test, almost every time. Peppermint just keeps trucking along, however. It hasn’t crashed on me yet, not when I’ve let it flounder under the weight of the above list of processes, and not while I’ve been actively using it to do stuff (like take screenshots, play with audio software, and write Linux Critic reviews of new distros). Since this old laptop is having a harder and harder time keeping up with the processor and memory requirements of modern applications — even Linux based ones — I’ve practically been using it like a netbook anyway. Even when I was running a regular distro (I like Linux Mint 8 Fluxbox CE on this laptop when I’m not evaluating something else for review purposes) I stopped using a mail client a while back (even Thunderbird was a little heavy, slow, and sluggish), so I do almost everything through a browser anyway. When I installed Peppermint on this laptop, it was already configured with that in mind. I really like the webapp implementation via Prism; it’s slick, and it still (kind of) feels like I’m running native apps that way. One thing I want to mention is Seesmic. I played around with Seesmic’s website a month or so ago and found it to be a bit heavy and slow to scroll and do basic things, so I gave up on it and settled back on just using Twitter’s default homepage for my tweets. But for some reason, running Seesmic through Prism seems to have gotten around this… it’s reasonably responsive, doesn’t peg my CPU every time I do anything on it, and it runs in its own window — if I didn’t know any better, I’d say I was running some local Twitter client, not a redirected website into a stripped down browser window. Anyway, Peppermint is geared toward exactly how I’ve been utilizing this old laptop, and because of that, there’s very little I need to tweak on it to make it feel like home. In short, it’s about time a good Linux distro came along that had this focus and did it this smoothly. While critical above on some of the application choices, as I had mentioned, that’s a subjective matter of personal choice. One of the great things about using a distro that has Ubuntu in its ancestry is the vast array of choices a guy like me has available. I really didn’t like the version of PCManFM Peppermint came with… so what? 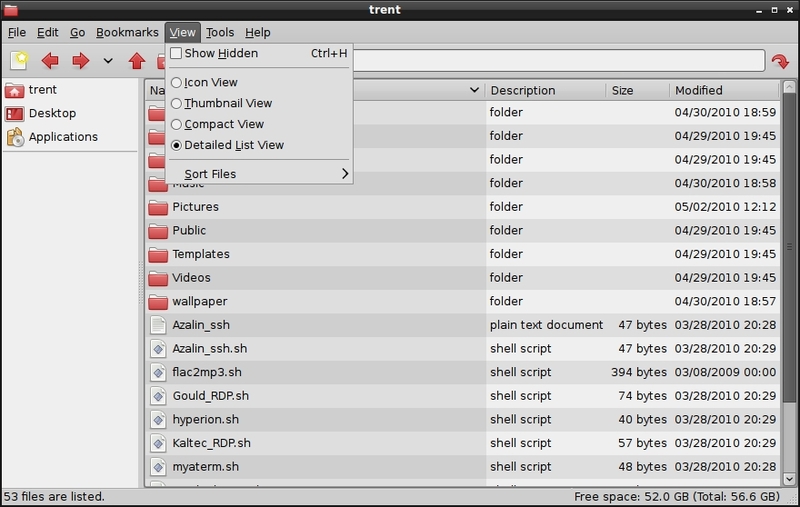 One sudo apt-get install thunar fired away and I have a better file manager. No graphical FTP application installed by default? Big deal! I open up LXTerminal and type sudo apt-get install gftp and a few seconds later I’m ready to go! Songbird runs slow and feels out of place in a distro like this? Not a problem! I sudo apt-get remove songbird and then sudo apt-get install decibel-audio-player and I immediately have a replacement! Choice and flexibility are beautiful things. Ultimately it means that the user — any user — has power to make their computing experience what they want it to be, what they need it to be, and that’s what it should be. Peppermint OS is among the first to try a lot of what it’s doing, and I think it does a great job of that. The sheer speed, respect for old hardware and minimal resources, and stability alone make it a standout, but the smooth way the Peppermint team (I’m looking at you, Kendall!) implemented the webapps seamlessly with the other native client-side applications makes this distro feel like it’s something that’s taken the next step toward a larger universe. That universe has the personal computer not being simply confined to running its code all by itself, but being embedded and a part of the web and the rest of the world as a whole. And that’s something I find exciting. My feelings about using Peppermint are overwhelmingly positive. It’s intuitive and user-friendly and I can honestly say that I’m going to leave it on this laptop for a while and see how things go. So far I’m very impressed, so I want to keep using it! Great job, Peppermint team! I look forward to what’s coming next! UPDATE: In response to this very early review, the Peppermint OS team had communicated a few changes they were making to the final release. I address some of that in my follow up, which is here. Thanks for reading! I’m afraid I must agree with you regarding PCManFM2. I’ve been using LXDE for about a year and I really like it’s speed and small memory footprint. But PCManFM has been the weakest link. Searching for files is horrible. I was hoping that would be fixed. Now that function was been removed also. I won’t say what I really feel. Other than that, LXDE rocks and is a great choice for peppermint. What I’m thinking is going on with PCManFM2 is related to (as you mentioned) the complete rewrite of it, from the ground up. I think the state it’s in right now reflects the fact that not all of its former features have been re-implemented yet, even if the main ones have. For me, Peppermint OS has a special role as THE PERFECT LIVE CD! A live CD is a temporary system, so a simple desktop that requires little setup and emphasizes webapps is ideal. Webapps tend to store data online so it can be referenced by other online systems, either temporary or permanent. If I boot Peppermint OS on my brother’s Windows computer, I’ll be able to create documents that I’ll be able to retrieve at home… or anywhere else on the web that I boot the live CD, or even, God forbid, if I’m forced to use a Windows computer. Depending on which machine I’m using, I have either 1 or two gigabytes of RAM, plenty of room to install these applications to the ramdisk. Because peppermint is based on mint, it has all the codecs I need in place. Again, this is especially valuble in a live CD. You don’t want to have to download a bunch of codecs every time you use the disk. Unlike Debian and Ubuntu, it has mplayer installed by default. I like to use mplayer from the command line, from which it excels. The GUI versions generally seem a little dicey. As alkways, it’s easy with a little practice. As always, the manpage is the fiirst place to look for information. I also think that, as a live CD, Peppermint OS is a great introduction to Linux for the li-curious. It’s an incredibly easy desktop that opens webapps that most windows users will find familiar. It just couldn’t be more painless. I’ve just installed the “second respin” of PeppermintOS and wouldn’t have noticed the lack of a tree-view in PCManFM 0.9.5 until I read your review. This isn’t such a big issue for me, though. What is important is what you pointed out. This distro is fast and stable and it’s perfect for my netbook. What more can I ask for? I’d just like to point out that songbird for linux isn’t dead– Builds are still made, they just aren’t officially supported by the songbird development team. Our group here at Sandia Labs reviewed Peppermint OS and was pleased with the operating system. Although the customer support on their IRC channel was rude and disrespectful to their guests. Also Kendall did not seem to entertain the idea of making more money or being funded for working with us on the cloud products. He was more worried about going for a drink at the local tavern. Good OS but not very delightful work ethic and customer service. Thats why linux doesn’t make it in this world. To many hacker want to bees and not enough real world business experience. Xubuntu has a flavor that is made with more quality and a much more stable environment. They also have better customer service and reliable upgrades. Anecdotal comments about IRC conversations? You have a pastebin link? Group #99201 said “Thats why linux doesn’t make it in this world.” In an open source world with 100s of 100s of distros how could one possibly blame the few that are less than formal on your perception of a failure that is debatable in of itself? Also Linux isn’t a corporation competing for market share, its an OS kernel. Some distros may be using the kernel to compete in the market, that’s their choice. Linux is about choice. Sorry you had an apparently bad experience if that indeed did occur. Cheers. I have the latest Peppermint One installed on my netbook. I think it will be staying there for a very long time. This is a superb distro. I’m running peppermint on my Tecra 8000 128mb 300mhz laptop and it is working like a charm. Haven’t figured out working the sound yet. I agree – that’s all! I'm a professional troubleshooter (a.k.a. IT Guy) and I've been using Linux as my main desktop OS for over a decade, at home as well as at work (even though I've worked predominately in Windows shops). Professionally I work for an IT services company, supporting mostly Windows servers and desktops belonging to our clients and end users. Personally, I'm a writer, a gamer, and a musician, and I'm also a movie buff. I still love technology though, and I'm always tinkering with computers on my home network. I'm more technical than the "average user" by quite a ways, but I like to think that there's no reason why Linux and Free/Open Source Software can't find a home on the average user's desktop as a part of their everyday computing life. I love to play around with technology, and I love to talk about it, so stick around and let me know what you're thinking. DISCLAIMER: The posts I write and publish on this blog are my own opinions and the opinions of those who contribute to The Linux Critic, and in no way reflect the opinions or official positions of my employer or any of the employers of my contributors. All content on this blog is copyright (C) Trent Isaacson unless otherwise indicated.